This IBM Redbooks® publication makes the case for using Operational Decision Manager for z/OS and provides an overview of its components. It is aimed at IT architects, enterprise architects, and development managers looking to build rule-based solutions. Step-by-step guidance is provided about getting started with business rules by using a scenario-based approach. This book provides detailed guidelines for testing and simulation and describes advanced options for decision authoring. Finally, it describes and documents multiple runtime configuration options. 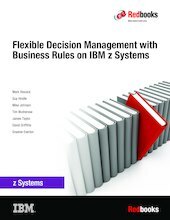 This third edition, SG24-8014-02, of this IBM Redbooks publication updated the information presented in this book to reflect function available in IBM Operational Decision Manager for z/OS Version 8.7.1.